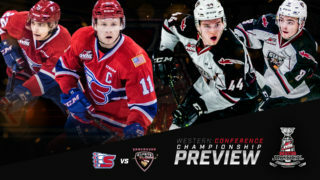 KENNEWICK, Wash. – The Tri-City Americans scored three goals in the second period – two on the power play – to overcome the Spokane Chiefs 4-3 on Sunday night in Kennewick in the annual New Year’s Eve battle. 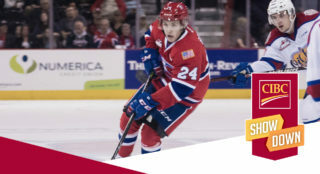 With the loss, the Chiefs fell two points behind Tri-City for third place in the U.S. Division as the Americans now lead the season series 3-2. Tri-City jumped out to a 1-0 lead just over 12 minutes into the game on a Riley Sawchuck goal. The Chiefs would answer right back as Jake McGrew snapped home his 6th of the season from between the circles 1:02 later to even the game at one. Spokane then took the lead on an Eli Zummack power play goal just 59 seconds after McGrew’s tally to go up 2-1. Zach Fischer then capped a three-goal opening frame with his 17th of the year on a rebound at 19:04 to give the Chiefs a 3-1 lead after one. Riley Woods got the primary assist on Fischer’s goal to extend his points scoring streak to nine-straight games. The Americans would come out in the second with three unanswered goals, two of them on the power play, in the first 12:44 of the period to re-take the lead for good at 4-3. 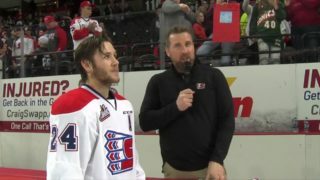 Spokane would outshoot Tri-City 46-26 in the game but Tri City goalie Patrick Dea turned away all 29 Chiefs shots over the final two periods to preserve the win. 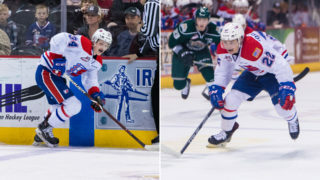 Spokane went 1-for-4 on the power play and 2-for-4 on the penalty kill. 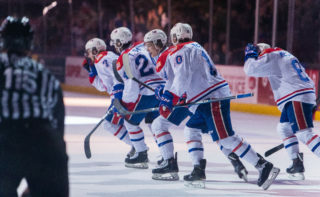 The Chiefs finished their four-games-in-five-nights stretch through the U.S. Division with two wins and two losses. 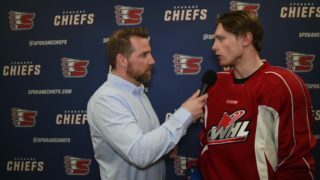 The Chiefs will return home Friday, January 5 when they host the second place Portland Winterhawks at 7:05 p.m. Mike Boyle will have the call on 1510 KGA starting with the pre- game show at 6:30 p.m.